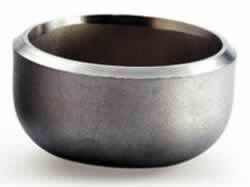 Pipe cap, Cap fittings | Sunny Steel Enterprise Ltd.
A pipe cap is a kind of Pipe fitting. It usually acts as a protective device designed to protect pipe ends of various pipes. The main use of pipe caps is to waterproof the connections. They can be fitted on water pump lines to remove air blocks, and also used in water supply lines, medical equipment, machinery, and processing equipment, and shipbuilding etc. 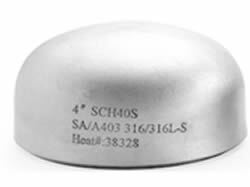 For wall thickness less than 3 mm, the caps are supplied with plain weld ends. Larger thicknesses are supplied with the weld bevel of 37 ½°±2 ½°. Transparent oil, rust-proof black oil or hot galvanized. Based on different materials, pipe caps include carbon steel cap, stainless steel cap, and alloy steel cap etc. Depending on their construction, pipe caps contain threaded cap, tapered cap and anti-roll cap etc. Pipe caps can be in various shapes. Some of the common shapes are hemispherical, oval, square, rectangular, U shape and I shape. This entry was posted in Pipe fittings and tagged pipe cap, pipe caps, Pipe fitting, stainless steel caps by sunnysteel. Bookmark the permalink.